Club Penguin – Happy Halloween 2012! Hi penguins! This is a quick post from Green, just to wish you Happy Halloween 2012! Yup, that’s right! Halloween day is here and I hope you have a really good time with your family and friends both in real life and Club Penguin! Meeting Gary the Gadget G by complete accident on the last day of the Halloween Party 2012! The first video of me randomly waddling ’round on Club Penguin on Halloween Night 2012. The second video of me randomly waddling ’round on Club Penguin on Halloween Night 2012. Well folks… I suppose that was all there is to show for now, but I hope you have a great Halloween today! Comment below what you think and goodbye! New Club Penguin Rooms – COMING SOON! What do you think guys? Pretty exciting and new, huh? What if they were on NOW on Club Penguin… how would YOU feel then? Comment below saying what you think, okay? I will discuss this in another post coming soon! See you later guys! Club Penguin – 7th Anniversary! That’s all I could do for the day, really… except for celebrating. I didn’t have much time for any pictures too by the way. I’m sorry guys – just really busy for now. But I’ll see you soon! Happy Birthday Club Penguin! Latest Sneak Peeks – Halloween Party 2012! Hi penguins! Guess what I found today for you? Some more sneak peeks for the upcoming Halloween Party 2012 in Club Penguin! Yup – it’s starting just in 3-4 days and these pictures you’re about to see were released just recently. NOTE: The pictures above were taken from the ”Club Penguin Daily News” website – the website where I serve as a main reporter for cheats, parties and secrets. New Club Penguin Song Out! Hi penguins! This song is quite old – it actually came out 10 days ago but it’s still pretty cool so I decided to share it with you here! Club Penguin released a new song called ”Ghosts Just Wanna Dance” recently, featuring Cadence and the Penguin Band. NOTE: This is only the sneak peek provided on iTunes and via YouTube. Stay tooned for the full version coming soon! Hey guys! Checked my last post yet? I talked a bit about the new character in Club Penguin – Gariwald VIII, Gary the Gadget Guy’s great uncle! I’ve managed to find some interesting trivia and information about him on the official Club Penguin Wiki. He is Gary’s great uncle, the uncle of either one of his parents. Gariwald’s Coffin is heavily protected and locked. 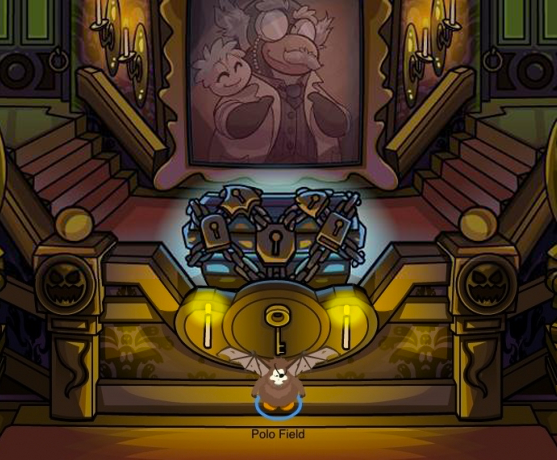 His coffin is placed in front of his huge portrait. As Sensei says that he arrived in Club Penguin Island before other penguins arrived, that means Sensei is possibly older than Gariwald VIII himself. He has a Puffle with him, and it could possibly be white. But the name of the puffle is still unknown. If he does indeed have a White Puffle, White Puffles were discovered in 2009, so this may mean that he may have died sometime after 2009 or white puffles were around before we discovered them and he found them. In all the sneak peek videos,he has the old aqua color, a possible new color yet to come to the game for all players. He has a Twitter Account but many people say it’s not made by The Club Penguin Team – a question that needs more investigation. You can see his ghost in the Ghost Lab even without the Ghost Goggles. He is a light blue in his sprite but a light brown in his pictures. Pretty interesting, huh? I hope you really found the information and trivia helpful. I sure did! Club Penguin – Halloween Party 2012 Sneak Peeks! That’s pretty awesome because we get to see what’s currently coming up in just about a week or something! I managed to find some interesting pictures that Club Penguin has posted. The show some of the upcoming rooms of the party. This year there’s going to be a Haunted Mansion full of secrets – it will replace the Haunted House that used to be near the Forest. Gariwald VIII was born some long time ago. His brother or sister soon had children, and one of those child – a son, Gary the Gadget Guy, making Gariwald Club Penguin’s resident inventor’s great uncle. Gariwald built a mansion for himself. He built a Ghost Lab to experiment and research ectoplasmic phenomena (in other words, ghosts). He ended up going missing inside of his mansion on Halloween night. Because of this incident, the mansion was deemed haunted. The mansion was discovered by Gary the Gadget Guy and his group of ghost hunters, who entered his great uncle’s mansion to hunt for Ghosts. Gary the Gadget Guy will be looking for clues about his great uncle and why he mysteriously vanished into thin air. These are the only things known about him so far, but there will be more soon! Stay tooned for more guys!